US Congre­ss on Wednes­day bestow­ed the countr­y's top civili­an award on microf­inance pionee­r. WASHINGTON: The US Congress on Wednesday bestowed the country’s top civilian award on microfinance pioneer Muhammad Yunus, in a rousing show of support to a man who is under fire in his native Bangladesh. Yunus, the founder of Grameen Bank which provides small loans to poor people usually excluded from the banking system, became the first Muslim to be awarded the Congressional Gold Medal. “Professor Yunus set out to do what may be the biggest thing of all, and that is liberating people to seek a better life,” Boehner said. Representative Rush Holt of New Jersey, who belongs to President Barack Obama’s Democratic Party, hailed Yunus as “a man who has shown most of us to be wrong” in their views of how economics work. “Banker, revolutionary and visionary are not words that are commonly associated with each other,” Holt said. Yunus and Grameen Bank won the 2006 Nobel Peace Prize, with the award committee crediting his decades of efforts with lifting from dire poverty millions of people in Bangladesh and elsewhere — particularly women. 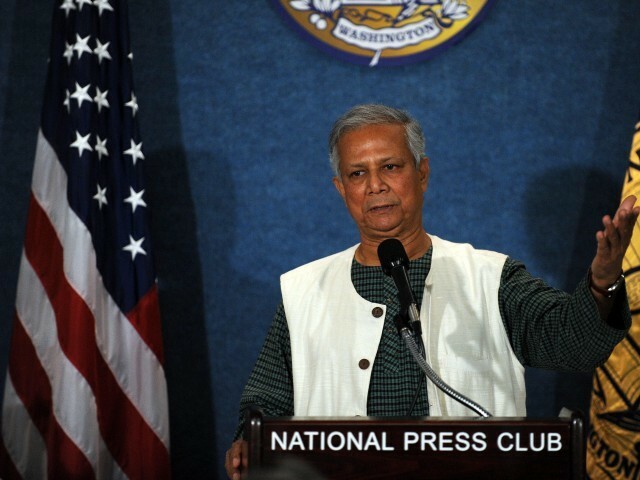 However, Yunus has faced pressure in Bangladesh where the government has increased control over Grameen Bank — a move critics say is aimed at keeping the banker in check if he bids to enter the nation’s deeply polarized politics. A visibly moved Yunus said he first visited the Capitol when he was teaching at Middle Tennessee State University. He said he came to Washington in 1971 to lobby the United States — unsuccessfully — to support Bangladesh’s independence from Pakistan. He thanked Congress for the “wonderful honor,” saying it was an endorsement of his microfinance ideas. “I am receiving it not for me but for all these women who have worked so hard to make you convinced they can take care of themselves given the financial institutional support — not charity,” he said. 10 years on, NGO Akhuwat has given Rs3.3 billion in microfinance for setting up or expanding businesses. One Easypaisa shop will be set up in each PPAF community to cater to their banking needs. Impressive growth likely to continue but regulation has to keep up. He did what no one could even imagine or dream those days. A great man. I admire him. What a personlity!!! He judged the potential and just see the spread of the results….